Inspirational favors are a perfect fit for any occasion. So whether you're celebrating the Christening or First Communion of your own little angel, adding a blessing to the marriage of a happy couple or anything in between, these angel bookmark favors really shine! 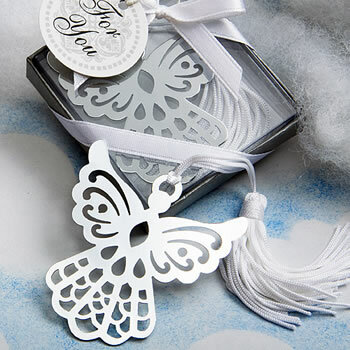 From Fashioncraft's exclusive Book Lovers Collection, each angel favor measures 5" x 1.75" (size includes the tassel), and has a silver bookmark in the shape of an angel with outstretched wings, enhanced with cutout details and topped with a cloth tassel attached at the halo. Each comes packaged in a Book Lover's Collection clear topped box with a silver base and white inside, tied with a white satin ribbon and an attached filigree design "For You" tag. Gave these to all the girls at our Father/Daughter dance. They loved them. Very well made, shipped rapidly and seller responds to inquiries quickly. Would recommend seller to all. The design is beautiful. The metal has a good weight to it. I may use it as a favor for our Christian women day luncheon. I ordered 60 angel bookmark favors for a special church activity last month. Our theme was “Angels Among Us.” These bookmarks were perfect handout. I was impressed with the quality—I was worried they would be cheap and bend easily. A friend at the activity asked me if she could buy any leftover angel bookmarks, but there weren’t any. They were a hit and I would definitely recommend them! I purchased these bookmarks to give out to all the teachers in two of the school's I work in. They are the perfect little thank-you gift. I ordered 100 of these beautiful Angel's, to be given to our women's group for Christmas. I received them in just 3 days after ordering! They were packed well for shipping and arrived in great shape. Each Angel has a table for hanging or to be used as a bookmark. She comes in her own pretty box, tied with ribbon and a gift tag. They are well made and very sweet. The price was so reasonable! I will definitely be ordering again. I am VERY happy with my purchase. Just what I expected. Simple and beautiful. Perfect for the baptism. Perfect - product is exactly as it looks on the website! Lovely party keepsake and nicely packaged ! Satisfied with item. They are very beautiful! Excellent customer service too. Wish they had free shipping on a minimum order. That pill was hard to swallow! Thanks so much, I love those Angels bookmark for the Baby Shower for my daughter is little gift, but is very pretty. The bookmarks are very nicely packaged and look nice. I think my guests will be pleased with their favors even tho they are smaller than I expected. We gave these away at my sister's baby shower and they were a big hit. Bought these for a favor for my daughter’s baby shower. Haven’t used them yet. Shower is the 17th of February. They are on time and look great. I ordered these the weekend before my father in laws memorial. I called on Monday morning to speak with someone about the delivery time. The number goes straight to a human being which is such a nice change from all that automated stuff. The woman I spoke with was very sweet and helpful. She assured me that the package would arrive on time and it arrived a day sooner than expected. This gift was the perfect keepsake for everyone that attended his celebration of life. It is classified as a bookmark but it can be used as an ornament. I hang mine on the door knob of my hutch where I can always see it and remember the good days and his laughter. Used these as part of a baptism favor. They are perfect and the guest can use theirs as a Christmas ornament to remind them of the baptism in the future.